Since a few days I am feeling excited that I will be able to use dual monitors. My second monitor doesn't have great quality in contrast and color depth- in fact it is a cheap monitor but it is great to be able to move all the secondary windows to this while working. In fact it feels a bit dizzy and confusing at the beginning because hardest part is that there is no taskbar on the second monitor due to the windows 7 limitation. So I made some search and discovered very nice tools and thought it would be useful to share all these with you who are new to using dual monitors like me. If you are like me and like to use many shortcuts and hotkeys from keyboard instead of mouse, then you will love these windows system shortcuts which are very handy. It is very handy to have the taskbar on your secondary monitor so that you don't have to go back to your primary monitor any time you want to make something with the taskbar and saves great time. And they work with the dialog boxes, material editor and unwrap windows as well ! 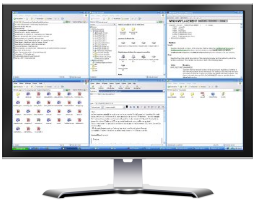 There are other commercial solutions which are combined with very detailed features such as Ultramon & Actual Multiple Monitors but at the moment I decided to use the freware ones.